A while ago I was lying in bed, all my joints were burning with pain, and all my muscles were aching and feeling so horrible. I laid there thinking about the Fibromyalgia diagnosis my GP had given me, and was also thinking about how I’d read online that other conditions can also cause Fibro like symptoms, including a thyroid that is not quite right. So I got out the computer, because I couldn’t sleep for the pain, and started to read. I found out that I could order my own lab test by myself, and decided to do a full thyroid panel. I’d asked my doctor to do a thyroid test years ago, and when she ran my blood, the only thing she ran was TSH. Which, I have since found out, is typical for mainstream general practitioners. I don’t have a super strong personality and I’m not great at standing up to people, especially doctors, so I paid for the test online. It had me make an appointment with a local blood-draw lab, so a couple of days later I went in for the appointment and had my blood drawn. Three days after that I received my lab results in an email, lickety split, wow that was easy! So with thyroid lab results in hand, I attacked the internet. And oh wow, there’s a ton of information about there about thyroid levels! I found out that TSH is a pretty meaningless measurement. TSH is produced by the Pituitary gland, and it’s a signal that tells the thyroid gland to produce, or not produce, thyroid hormones. In theory, if your thyroid is super low, your TSH will be super high, telling your thyroid to produce more. And Vice Versa. However, it seems most of the time the TSH does not accurately tell the thyroid what to produce. Instead, a person needs to test, among other things, their Free T4, Free T3, and Reverse T3. Without going into super detail about these numbers (if you want more information about them, go here). In short, the cells in our bodies use T3. T4 is converted into T3. And RT3 is telling our bodies to stop using, or producing, T3. So… the important number is really T3. And my T3s are super low! Which makes me hypothyroid, because my cells are not getting the T3 hormone that is so important. And when that happens, pain, misery, and just awfulness can result. (For a big list of symptoms, you can go here.) I also have a very high RT3, which is telling my body to stop producing T3s, which is messing me up in another way! So, how does this all relate to dog sports, like my blog is geared to? Well… let me tell you. After I do a three day weekend of any sport, I am miserable for about two or three days afterward. So miserable that I pretty much sleep for the first two days. My body aches, I’m exhausted, and I feel rotten. And if I had Fibromyalgia, there’s really no cure for that. But, I probably don’t! I have thyroid issues that cause symptoms like FMS, and thyroid issues CAN BE TREATED! So I actually now think maybe, just maybe, dog sports won’t totally take me out in the future. I have some hope! After I scoured the web for a week or so, I debated what sort of doctor I wanted to take my test results to. I considered going back to my regular GP, but then thought why, would I have to fight for the T3 meds that I’m learning that is what I need? I could go see a new endocrinologist, as they deal with thyroid issues, but what if I encounter the same brick wall? So I read more online and found a Naturopath near where I live that received some great reviews from others suffering from thyroid issues. I made an appointment with the Cameron Wellness Center and went in. I really like him! He explained more about T4s, T3s, and RT3s, and immediately put me on T3 medication (Liothyronine). Wooo! Exactly what I wanted. And he even seemed happy that I had educated myself! I get tired of doctors who groan and moan when I go in and say I read this and that… he was actually happy about it. How is that for a nice change! So I started taking the meds… but let me give you some advice. 🙂 Don’t start taking a new medication the Thursday before a three-day agility trial! I took too much initially, and by Saturday, I was buzzing and flying and feeling quite odd! And of course, since it was a weekend, I couldn’t call and ask what to do. So I cut my pills in half and on Sunday took 1/2 a pill. They are 5mcg pills each, so I took 2.5mcg. A couple of days after that, I was feeling much more normal. Though over the next few months I will be increasing my dosage slowly, each week, until my symptoms go away. I am still not completely convinced that I will get all better and have no more symptoms, but I have hope. And hope is good! So… in order to keep this post from taking a whole day to read, I will stop now. I’ll post later about other things my NP found in more blood work. And what’s going on with my meds and my symptoms and how I feel. And while this is not really dog related, this is my blog, and I feel the need to talk about this journey I’m now going to be having with my thyroid issues, as well as other things. Hormones, wow, what a big difference they can make! 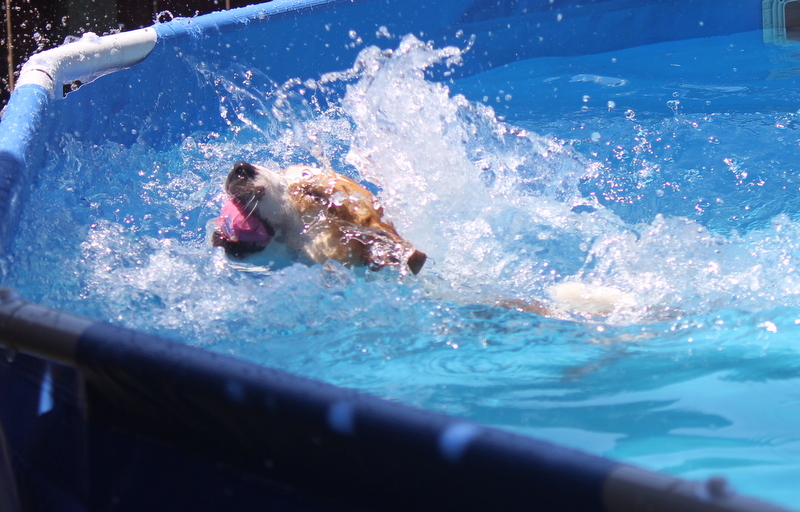 I also stuck in some pictures of my dogs in the pool in our yard, because hey, they are having such a great time, and I love summer, and I love seeing the dogs have a blast in the pool! 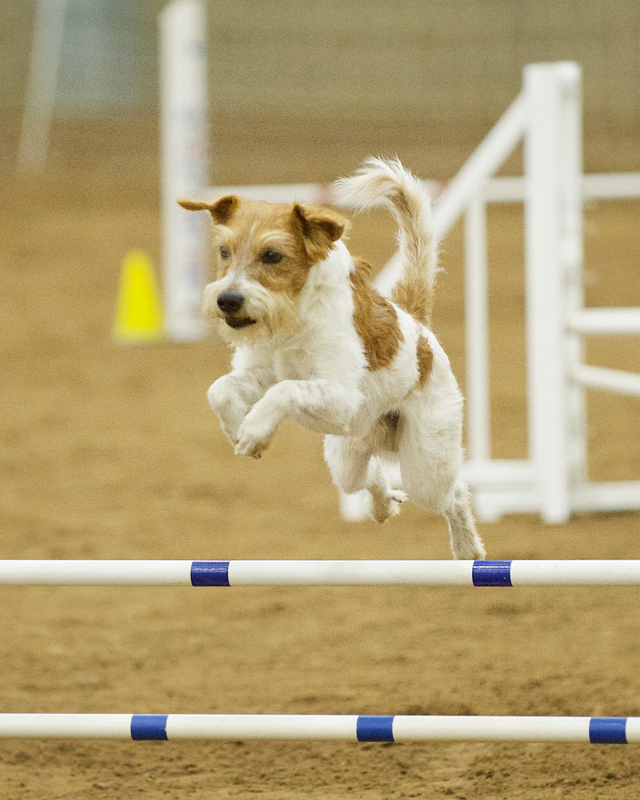 I’ve been pretty lucky during my agility career, in that my dogs have been pretty natural jumpers and have learned quickly on their own. I now have a dog which is very agile, and is a very good jumper, but is lacking the confidence to be able to jump on a regular basis all on his own. And so now I find myself learning all about how to teach a dog how to jump. This is a picture of Maze jumping, isn’t he just the cutest guy? 🙂 I love Mr. Maze, and I want to help him be a confident jumper who has a lot of fun doing agility. He will currently do a couple of jumps, but then he will go around most of the jumps on a course. And so now I get to learn all about improving a dog’s confidence about jumping. I am currently reading the book by Suzanne Clothier about Jumping called The Clothier Natural (Dog) Jumping Method . 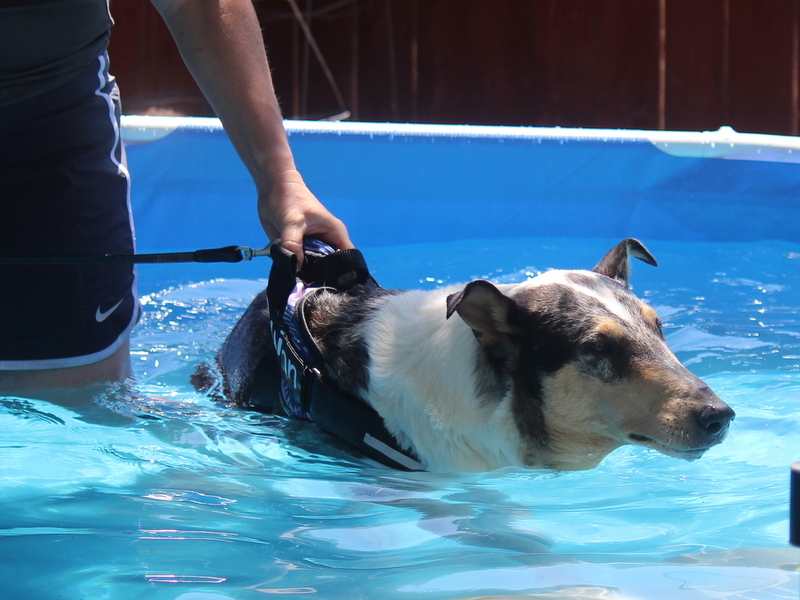 She advises about how to determine a proper stride length for a dog in order for him to learn a comfortable and confident jumping. So far I’m quite enjoying the book. I also am reading Jumping A to Z by Chris Zink and Julie Daniels. 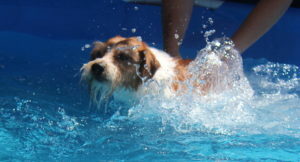 Jumping from A to Z: Teach Your Dog to Soar I’ve had this book for a long time, but I have never read the whole thing. So, off I go for some reading! I set up some jumps for Maze based on the Clothier method, and I think he’s doing really well. I’m going to adjust the spacing, though, because I think my calculations were off and he needs jumps just a little further apart. So now the jumping training fun starts. Maze is teaching me all about things I have skimmed over in the past with other dogs. So here we go, let’s learn to jump! Recently I was in Sacremento at the Collie National Specialty with my smooth blue collie, Quinn. 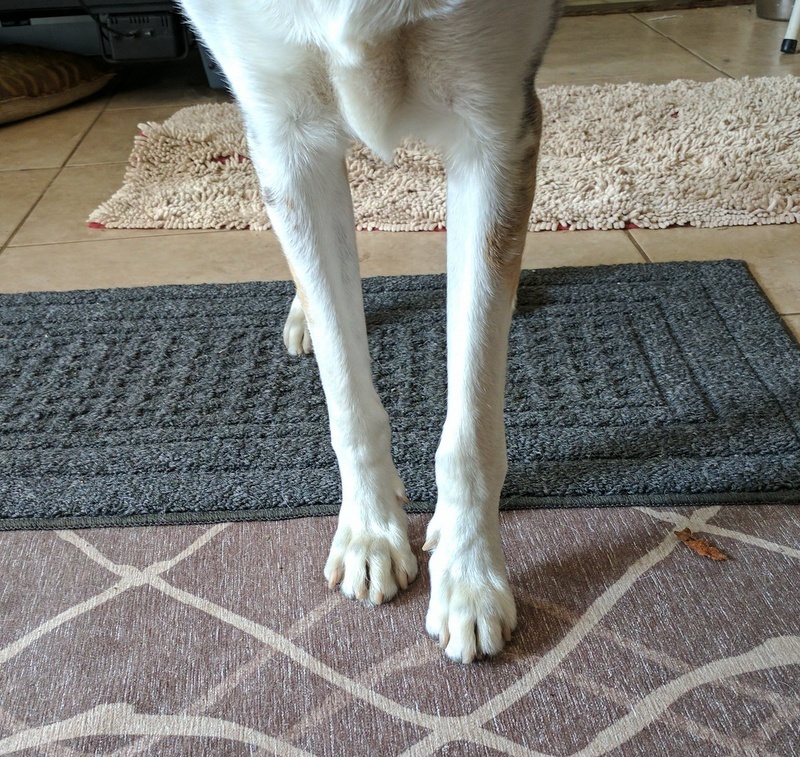 About a year earlier he had sprained a toe, and he was just fully recovered from that injury (boy, do toes take forever to heal!) and we were all ready to have a couple fun days of herding, a couple fun days of agility, some fun in the breed ring and then do some rally. His herding went really well, and he got his first HT leg with the help of a friend who handled him, as I’m not too great handling him in herding myself. 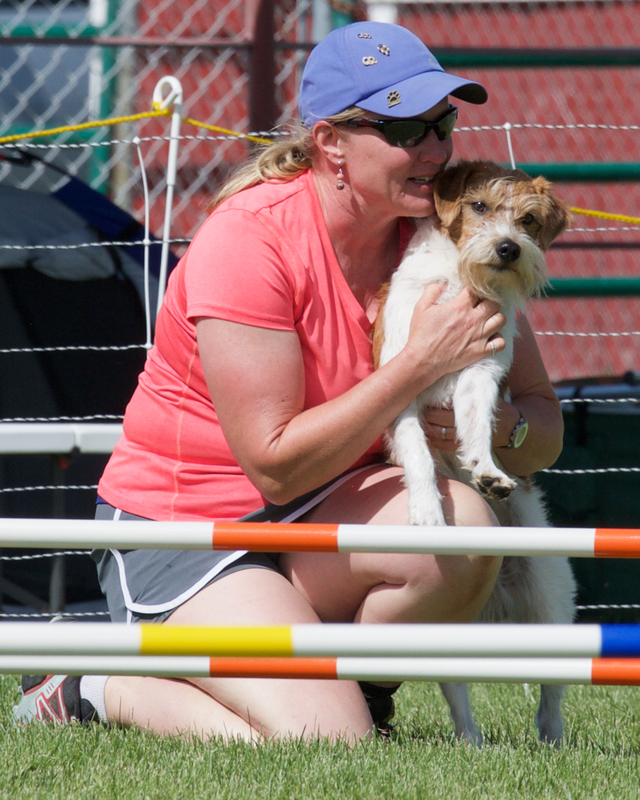 The first day of agility was for fun, because he’d only had one trial, in February, and nothing before that for nearly an entire year, so we were just getting back into the groove. Quinn will be five years old this month (April 2017) and taking all that time out to heal from a toe was rather annoying, but we did it. 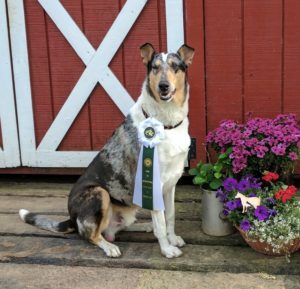 During that time we had a lot of fun in Barn Hunt (he’s great at Barn Hunt and runs at the Masters level) and started doing some UKC Nosework as well. Anyway, to make a long story short, he and I were all ready to continue doing agility and have a great time, and while he didn’t Q in his Standard run on the first day, we had a most gorgeous Open JWW Qualifying run and I thought yay, we are back, and we are going to have a great agility career! 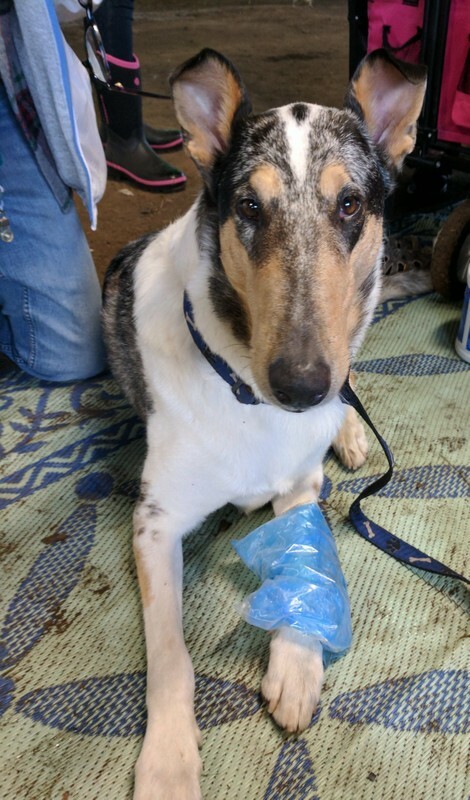 Well, the second day of agility, disaster struck. Quinn is not a fast dog. Most collies are not fast dogs in agility, as speed goes. But he’s steady and solid, his contacts have always been good and reliable… until the Standard run where he didn’t tip the teeter right and it fell out from under him. He must have rolled his left leg wrong, because he fell on his wrist coming off the teeter. He cried… oh boy did he cry. When a traumatic event happens to me, I go into “Take Care Of It” mode. When I’ve been in my car rollovers, I took care of things and didn’t break down until later, or the next day. This was the same thing. I stood by him, comforted him, and hoped for the best. The agility community there was wonderful, and so many people tried to help, offer love and comfort and care, which was awesome. I cannot express how much I appreciated the support I felt there. Collie agility folk are wonderful. If you’d like to see the agility video, here it is. Be warned, there is crying on Quinn’s part after the teeter. And it’s a heart-breaking cry for a dog lover. I was hoping, as was everyone else, that he’d shake it off and be walking fine the next day. We had conformation and rally to do! If he would have been able to get a Q in Rally, or even just show in the breed ring, he would have qualified for a versatility ribbon, which I’ve never had a dog get before, and I was excited to get one with Quinn! Alas, it was not to be. Quinn didn’t recover the next day. He kept limping, though he didn’t cry anymore, thank goodness. Here is the teeter part of his run clipped out, blown up, and slowed down, if you’d like to see what happened in more detail. I can’t watch it anymore, it breaks my heart. I don’t like seeing any dog, especially my own, be injured in any way. And having them cry, that is the worst thing I can imagine. Quinn and I stayed at Collie Nationals for another day, but my heart was breaking, seeing him in pain, and unable to participate in the activities around us. And seeing all the pretty, sound, happy collies. So we left and came home early. I was so grateful that Quinn’s breeder was with us for this entire experience, as she’s wonderful, and such a great support. When I got home, I rested Quinn, and he seemed okay. 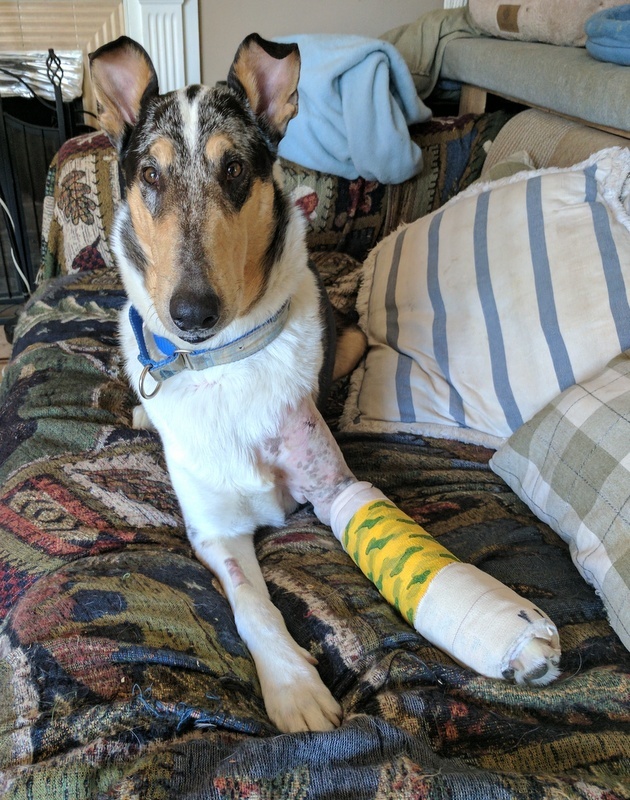 I took him to our close emergency vet, and they took x-rays and said that his carpal bone had been fractured, but from what they could see, he wouldn’t need any surgery… well, after a few days went by, Quinn started to hyperextend that wrist. And I didn’t want to wait any longer so contacted a Canine Physical Therapist friend and sent her the videos of Quinn that I’d taken of him hyperextending. 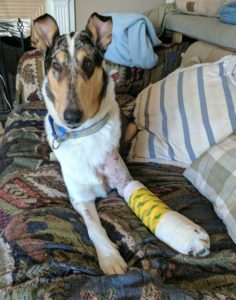 My PT friend sent his videos to the vet I already had an appointment with the following Tuesday, but when he saw them, he said that Quinn needed to go in right away because he suspected he had a carpal hyperextention injury. And that is not good. That basically meant his tendon has been ruined. And that, of course, broke my heart all over again. All this from a teeter injury. All this from the teeter falling out from under him. All this for the sport of agility. I never thought this would happen to one of my dogs. I never thought that agility would cause such a major injury in one of my dogs. I know agility can be dangerous, but I have always been careful. I’ve always trained my dogs well. 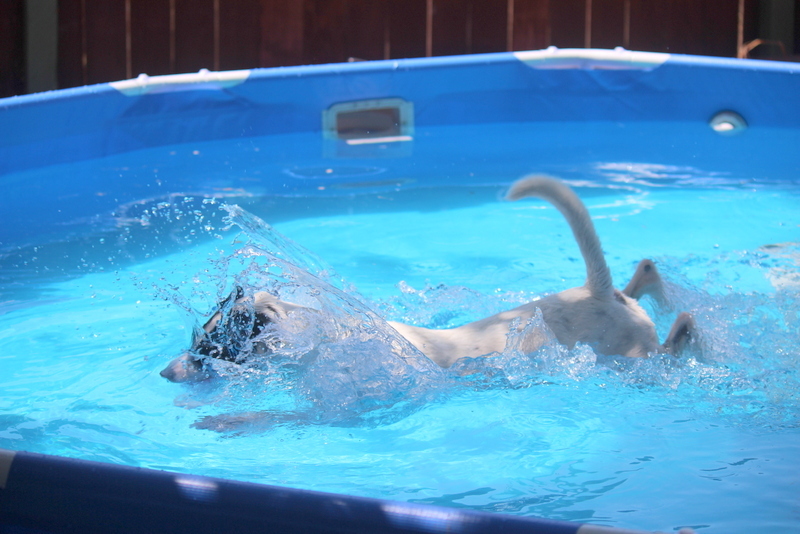 I’ve always felt like my dogs will be safe and sound and have fun. But now, well, now what do I think? 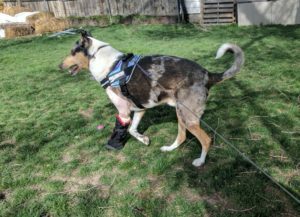 I’ll post again about the thoughts I now have about my poor dog, Quinn, my sweet collie boy, and the consequences he’ll be suffering through for the rest of his life. Ah Quinn, I’m so sorry. The surgery to have his bones fused cost over $3,500.00. And while cost is no issue when it comes to the health of my dogs I don’t, unfortunately, have that kind of money laying around. But we’ll pay it, of course, and we’ll make sure Quinn gets the best care he can. I’m sorry Quinn. I’m so so sorry. ???? ???? ??? ?